Elphinstone Plateau is magnificently wild, forming an outstanding undeveloped peninsula-plateau jutting out into the Megalong. It has long been a favourite wilderness destination for bushwalkers and rock climbers alike. This predominantly natural and undisturbed plateau is mistakenly also referred to as ‘radiata plateau‘ due to a small invasive private pine plantation from the 1970s covering less that 5% of the plateau along an access track . The plantation failed and the owner went broke. Yet little known Elphinstone Plateau remains special home to rare and threatened regionally native species, culturally significant to local Aboriginal peoples and a magnet for the local outdoor community. Sitting on the southern escarpment, Elphinstone Plateau, just west of Katoomba, towers high above rolling valleys has outstanding topography. 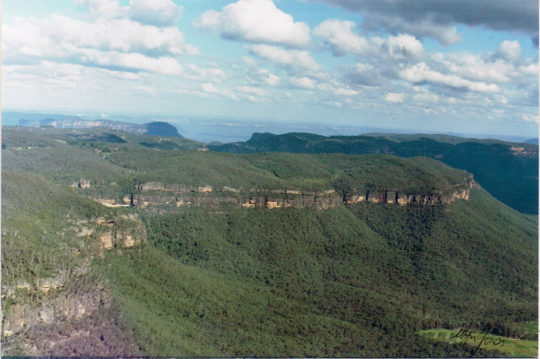 It remains the last remaining undeveloped peninsula-plateau in the upper Blue Mountains. The Plateau has significant biodiversity, including vegetation communities such Blue Mountain Swamps, Eucalyptus Oreades Open Forest and Blue Mountains Heath. It is also home to many endangered species including the Flame Robin, Glossy Black Cockatoo, Gang-Gang Cockatoo and the Varied Sittella as well as the Tiger Quoll, frequently sighted by locals. 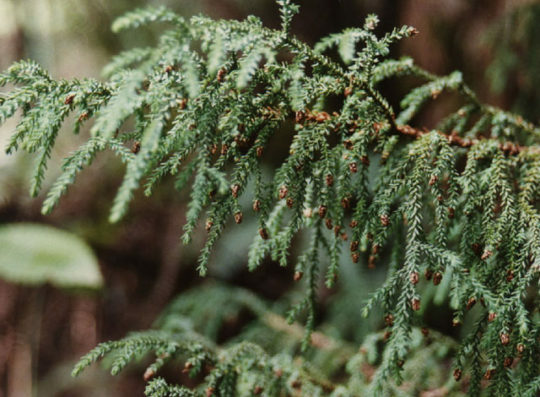 Threatened plants include one of only ten places on the planet where the Dwarf (Blue) Mountain Pine (Pherosphaera fitzgeraldii) is endemic on the planet to the immediate upper Central Blue Mountains with its distribution fragmented to a few south-facing hanging swamp cliff faces on the Blue Mountains western escarpment at Elphinstone above Nellies Glen and nearby around Wentworth Falls above the Jamison Valley. The IUCN reports that this taxon is endangered. It faces a very high risk of extinction in the wild in the near future due to a small population size and severe population fragmentation, with no sub-population estimated to contain more than 250 mature individuals. 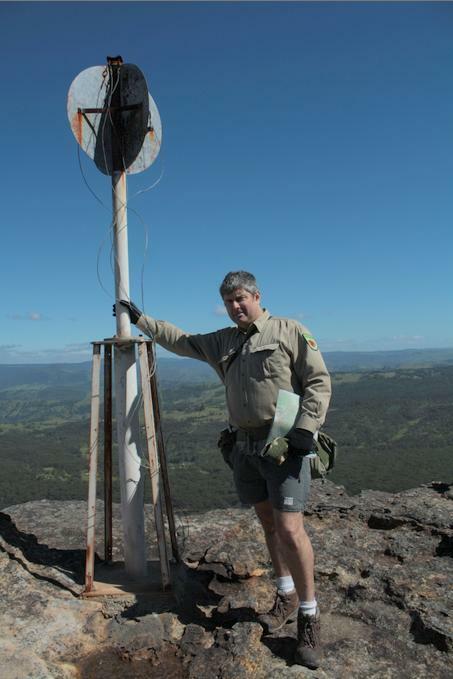 Steven, one of our local conservationists says that this wild plateau has significant biodiversity – Blue Mountain Swamps, rare Eucalyptus oreades Open Forest and many endangered species including the Flame Robin, Glossy Black Cockatoo, Gang-Gang Cockatoo, and the almost unknown Tiger Quoll. 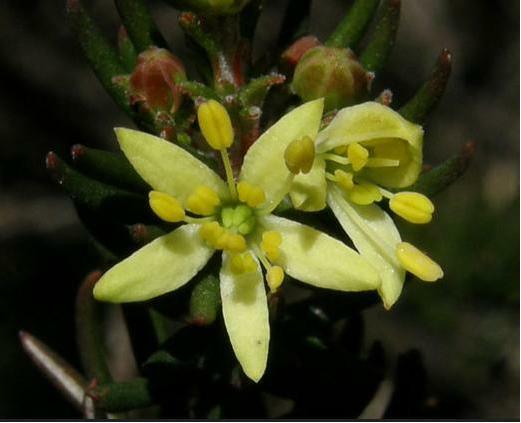 Steven says that the plateau and its immediate surrounds provide are the only locality on the planet to naturally support the critically endangered Dwarf Mountain Pine and the little-known yellow flowering shrub Elphinstone Boronia (Leionema lachnaeoides). Both are threatened with extinction and their survival depends on the area remaining undisturbed. 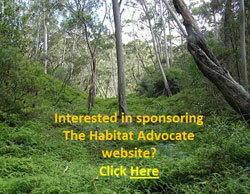 Survival depends on the area remaining undisturbed. Steven says local resident Glenn Humphreys has been involved with trying to protect and save Mount Elphinstone from housing development on and off for more than 25 years, successfully halting all sorts of elaborate development proposals. But now this wild and unique haven is at risk. An integrated part of the Blue Mountains western escarpment has come under threat of land use development again – Mount Elphinstone (also mistakenly called Radiata Plateau) situated a few kilometres west of Katoomba. Apart from a small area of Crown Land the majority of the Plateau is privately owned by a group that have repeatedly lodged development applications since the 1990s. Mount Elphinstone, being the highest rise on the plateau is believed named after Major General Sir Howard Craufurd Elphinstone, VC, KCB, CMG (1829 – 1890) who was a British Army officer and a recipient of the Victoria Cross. Born in Livonia (now Estonia), Elphinstone joined the British Corps of Royal Engineers as a gentleman cadet at the Royal Military Academy, Woolwich and was commissioned as a second lieutenant in December 1847. With the outbreak of the Crimean War, Elphinstone was posted to the Crimea. On 18 June 1855, he was 25 years old, and a lieutenant in the Royal Engineers, during the Siege of Sebastopol when the following deed took place for which he was awarded the Victoria Cross.VC. With the end of the war he was decorated by both Napoleon III, Emperor of France being appointed as a Knight of the Legion of Honour. A proposed private development threatens its future. Currently, two of three development applications recently lodged have been refused, leaving one approved for two dwellings. They pose an inappropriate development wedge to future residential exploitation of this still wild plateau. Now is the time to prevent any building and move the Plateau in public ownership for protection. This could be the public’s last chance to secure the future of this stunning area and have Elphinstone Plateau become part of the National Park estate. Blue Mountains residents, the local outdoor community, and the Blue Mountains Conservation Society are all firmly committed to seeking protection for the Plateau. We were delighted with all the community support our campaign received at Winter Magic – with lots of cheers from the crowd during the parade and most importantly all the letters sent off to the Minister for the Environment. We are seeking to have Elphinstone Plateau purchased by the New South Wales or Australian Commonwealth governments and be incorporated into the Blue Mountains World Heritage Area. But the battle is not yet won. The local Blue Mountains Conservation Society is championing an environmental campaign to oppose the land use development and to have the plateau incorporated into the adjacent Blue Mountains World Heritage Area. The Society is inviting locals and those passionate about protecting this special place, to join in a rally on Sunday 30th July at 1.30pm at Cahill’s Lookout, Cliff Drive, Katoomba. This entry was posted on Wednesday, July 26th, 2017	and is filed under Blue Mountains (AU), Endangered Wildlife (EN), Quolls, Threats from Development, Threats from Weak Environmental Laws, Wilderness.